The Royal Asiatic Society has been collecting material for almost two centuries, and holds many objects whose origins date back far into the previous millennium. Looking after a diverse and important collection of paintings, manuscripts, drawings, books, and archives is a significant responsibility, especially for an organization with relatively limited resources. Although today our collections are kept in a climate-controlled environment and are subject to strict handling protocols, some parts of the collection show evidence of wear and tear through historical use, or other indicators that they were not ideally looked after in the past. We often have to look for outside support for conservation projects to restore this kind of historical damage. For example, in 2014-5 we received grants from the National Manuscripts Conservation Trust and Sino-British Fellowship Trust to conserve a two-volume Latin-Chinese dictionary, which dated from 1745. Recently, we have been extremely grateful to receive another kind of external support for the conservation of items from our collections, in collaboration with Camberwell College of Arts (part of the University of Arts London). 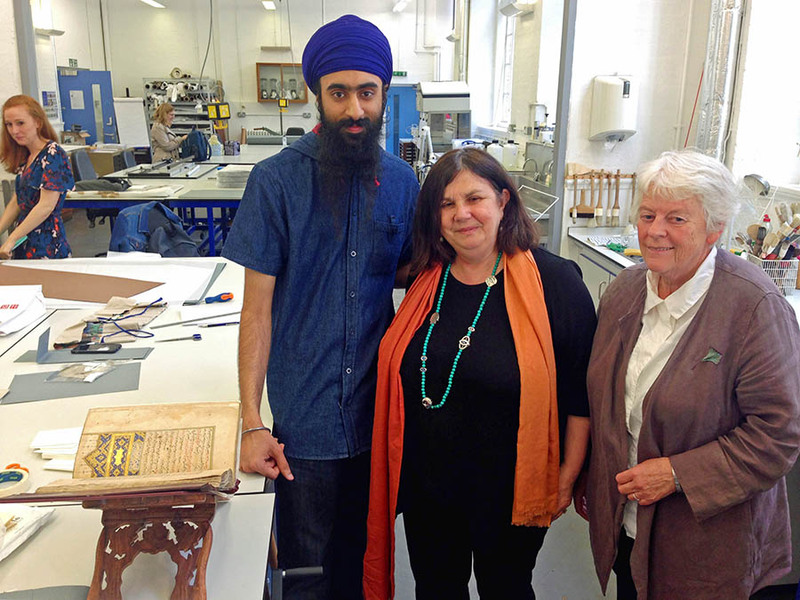 Bethia Grice and Jasdip Singh Dhillon, two students from the Conservation MA programme, selected items from our collection to work on as part of their individual final projects. 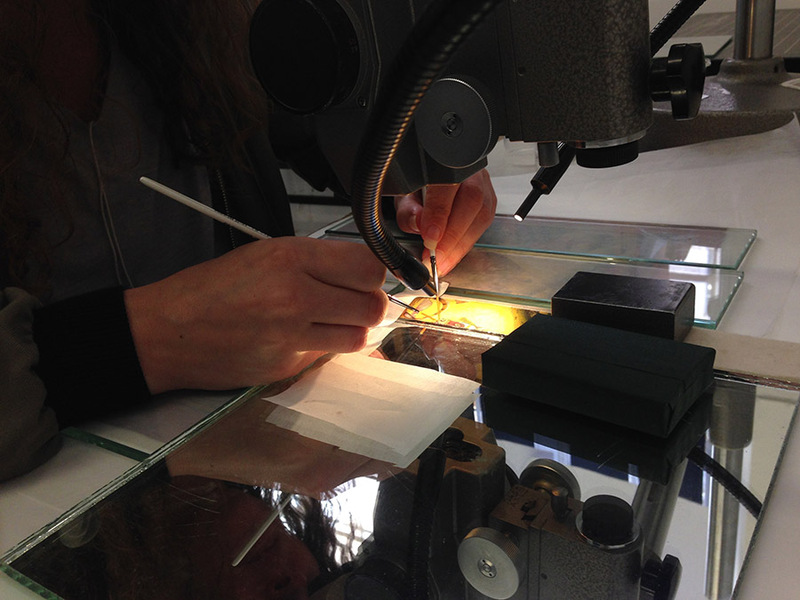 As part of this process, they had to carefully assess the condition of the selected objects; submit a treatment proposal for consideration; and then embark on the conservation itself. All their work was then written up into a final report, which they presented at a symposium and exhibition at Camberwell in late June. Students benefitted from the support and guidance of experienced conservation staff at Camberwell, as well as consulting with staff at lending institutions; but the ultimate success of the projects was down to the initiative, skill and diligence of the students themselves. 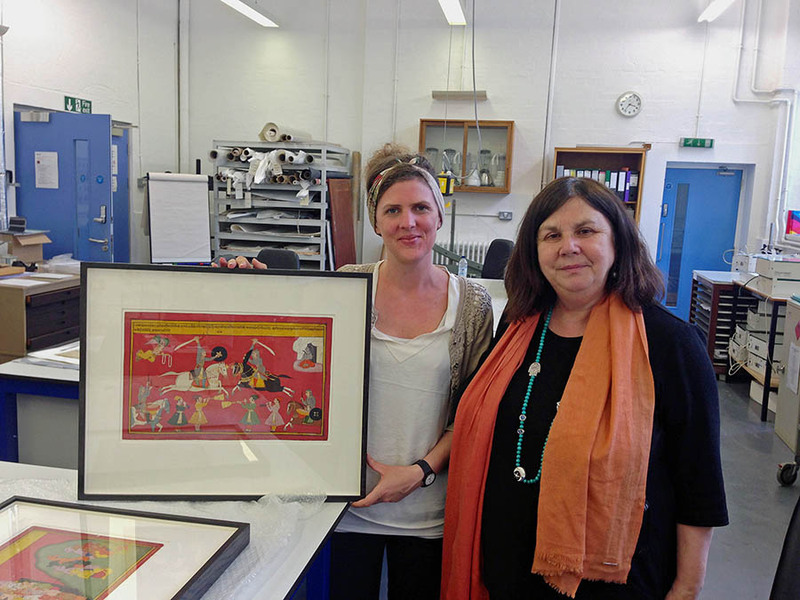 For her conservation project, Bethia Grice selected three Indian paintings from our James Tod Collection. Col. James Tod (1782-1835) was East India Company Political Agent to the Western Rajput States between 1818 and 1822, and collected many paintings and manuscripts during his time in Udaipur. Many of the paintings in his collection were commissioned by him as copies of Indian originals, which Tod was interested in acquiring because of the historical information they contained. When he returned to Great Britain, Tod served as the Royal Asiatic Society’s first Librarian, and his private collection served as the basis for his two-volume historical work, Annals and antiquities of Rajasthan. The Tod Collection which is now at the Society was presented by Tod’s executors after his death. The paintings conserved by Bethia are ‘Rajput princesses killing a lion’ (RAS 061.002), ‘The patriarch Kashyapar with his wife and progeny and the saint Sukra’ (063.038), and ‘Battle between Prince Kandarpaketu and an Udaithe Raja with Shiva as spectator’ (063.039). These paintings presented a number of conservation challenges. Although they are visually striking and historically interesting, the paintings exhibited a number of physical problems: they were particularly vulnerable to damage and pigment loss due to a flaking pigment surface, which also rendered them sensitive to abrasion. One of the paintings had also been mounted in the past on acidic mount board, while the other two were un-mounted, and so mounting each of the three paintings appropriately was another objective of the project. In addition to light surface cleaning of the paintings, Bethia had to consolidate them to prevent further pigment flaking and loss. 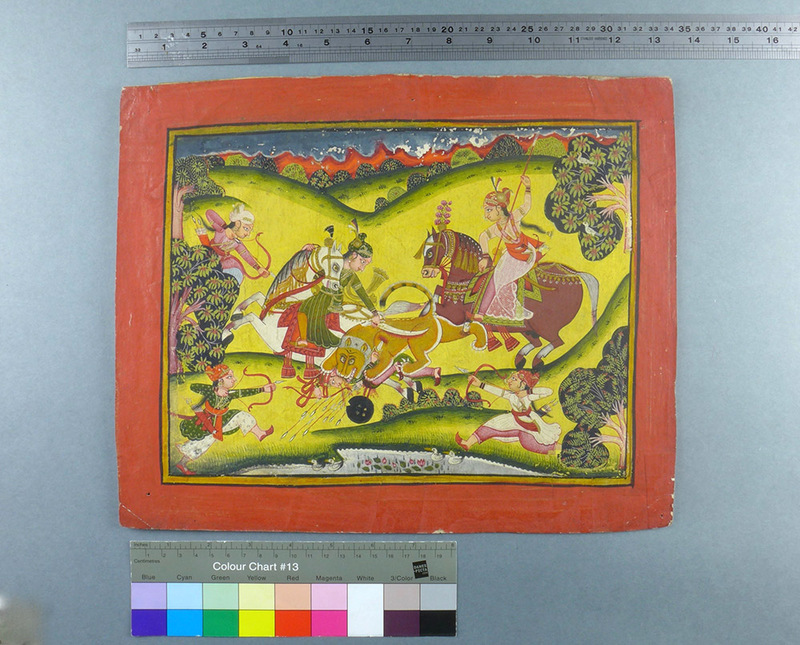 Her report indicated how conservators consider culturally appropriate treatment methods, for example in this case using non-animal based adhesive. Once the paintings had been consolidated, and the old acidic mount and adhesive removed, the paintings were re-mounted in a landscape format consistent with the rest of the Tod Collection. The main consideration for the mounting of these works was to create a bespoke system where the paintings could be handled without direct contact. The aim is to allow the verso to be viewed by researchers, while keep the substrate flat and allowing the border to be fully viewable. While many of the other Tod paintings are still mounted on sub-optimal mounts, we are pleased to now have these paintings mounted appropriately which we can use as a benchmark for planning future conservation of the rest of the collection. They are also now framed which will allow us to display them in appropriate areas of our building, where they will not be subjected to UV light. Moreover, the fact that the pigment is no longer flaking and subject to loss is an important achievement in guaranteeing the long-term survival of these paintings. 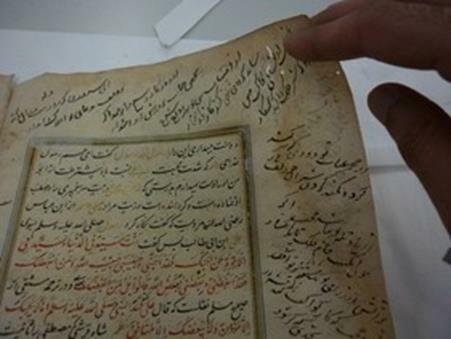 For his project, Jasdip Singh Dhillon chose to conserve one of our Persian manuscripts, which is catalogued as RAS Persian 19 + 51. This is an unusual manuscript because, as its shelf mark suggests, it is a single volume containing two works which have been catalogued separately. The works are catalogued as ‘Raudat al-Ahbab fi Siyar al-Nabi wa-‘l-Al wa’l-Ashab’, and ‘Habib al-siyar. First chapter of the second volume’. The manuscript came to the Society in the bequest of the collection of Major David Price (1762-1835). 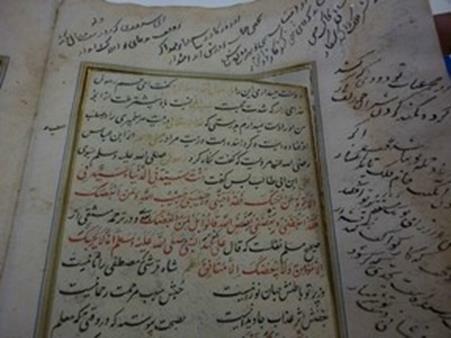 Price was an officer in the East India Company who developed a substantial interest in Persian culture and Asian history, and his manuscripts form a significant part of the Society’s Persian-language collections. The volume which comprises RAS Persian 19 + 51 probably dates from the late sixteenth century CE, as the colophon indicates it was completed in AH 999 (1590 CE). 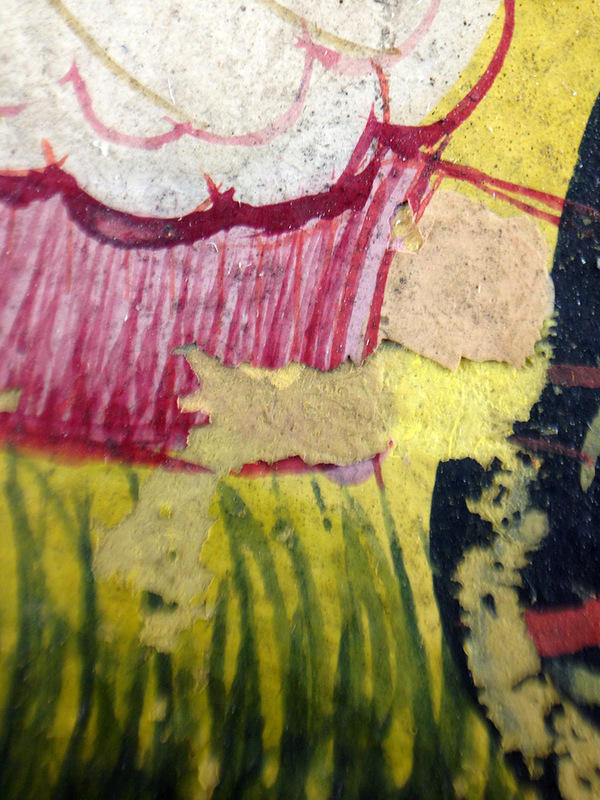 Although the manuscript’s paper was in good condition overall, tidelines from historical water damage had obscured the text and caused pigments to migrate in a number of places. In others, copper green pigment had caused the substrate to oxidise heavily along border illuminations, leading to sheer cracks along the borders. 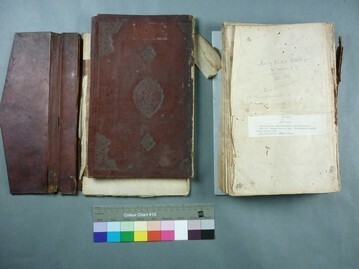 The structure of the manuscript was in poor condition, with a number of borderline textblock breaks, and the shape of the spine was heavily distorted and concave. 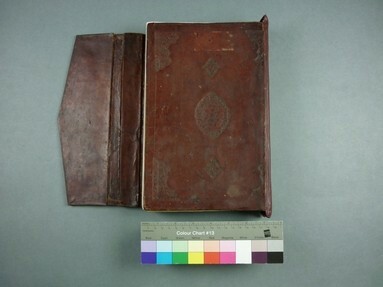 The cover was also in bad condition, with the boards being entirely detached, and with broken corners and surface dirt. Jasdip had to separate the textblock into its sections, securing tears and breaks using fine Japanese paper. 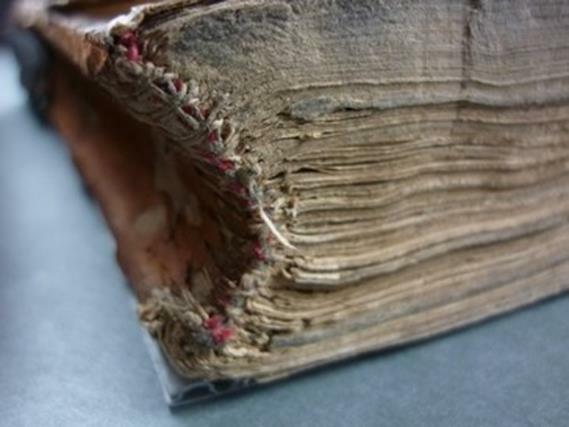 The manuscript had been used over the centuries as a working document, and contained many historical repairs carried out by conservators in the past to repair mechanical damage. These were to be removed where they caused damage or obscured the text, such as on the first bifolio where they covered part of the illumination; but in most other places they were left intact as they form part of the manuscript’s history and are evidence of its usage. 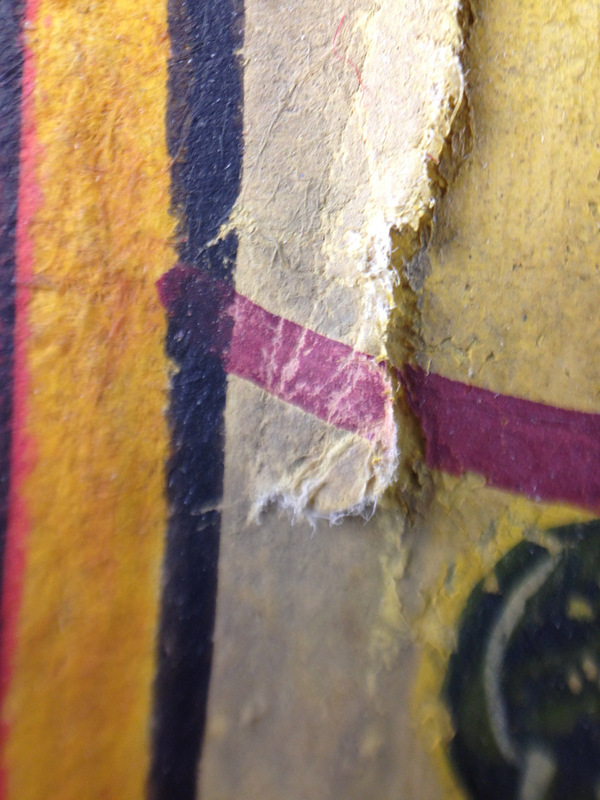 As well as the paper repairs and surface cleaning, Jasdip also had to re-sew the entire manuscript. This was a complex process that required a sophisticated approach, and in the end new endbands were sewn through an aerocotton lining, around a core of twisted linen/polyester braid. 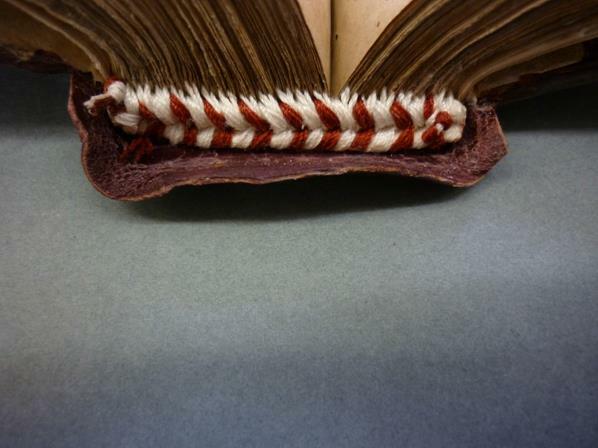 The colour of the secondary sewing matched the red/cream combination of the original. The end product is a manuscript which looks completely revitalised, and which can now be used by researchers; where previously any use of the manuscript would cause further damage to the folios and structure. Jasdip also designed new handling instructions for the manuscript, which are based on the innate structure of the volume and stem from the context within which it would have originally been used. This is important to help prevent damage to the manuscript in future. We are enormously grateful to Jasdip and Bethia for their work on our collections. Both of them demonstrated huge care, consideration and expertise, and they have helped to ensure the survival of these important objects for future generations of researchers. We hope that the experience serves them well not only for the successful completion of their Master’s degrees, but also as a reference point in their future careers. We are also very grateful to Camberwell College of Arts, and the programme staff Jocelyn Cuming and Eleni Katsiani, for working with us over the past year, and look forward to hopefully welcoming more students from Camberwell to help conserve our collections in the future.